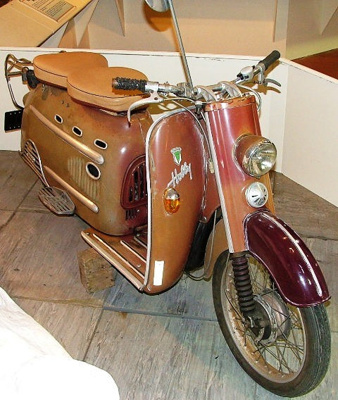 Auto Union - DKW 'Hobby' motor scooter. Blended red, tan/orange and maroon coloured, two leather saddles, black rubber handle bars, back metal extension, elaborate foot grates for passenger. Pan Am ticker on scooter rear, and an auto union monogram around the scooter.